As those who know me well will acknowledge, I do like my football (soccer). I attended my first match back at the age of 5 in 1965 at Boothferry Park in Hull to watch the Tigers and have been hooked ever since. I’m not the only one as the World Cup unfolds in Brazil, millions perhaps billions of others are following the games, the drama and the action. One or two American friends continue to ask what the attraction is and have no understanding of how two teams can compete and draw but my advice to them is to think what that means about the US culture. What does it mean about your culture that you think you have to always win? There are many who would rather Americans retained their disdain for soccer and left it to the rest of the world. The reason is that they constantly want to tinker with the game to improve it and of course, they want to dominate and win everything. The rest of the world are able to understand that it’s not winning but the taking part that counts. Or do they? 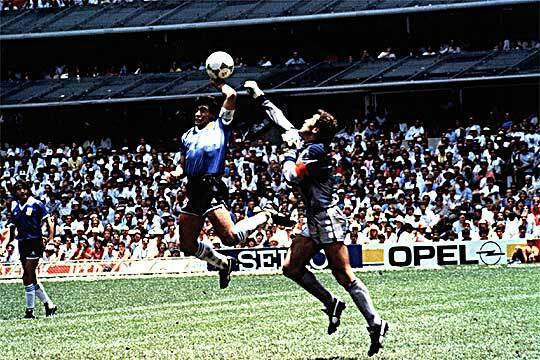 Everyone recalls the hand of God? Diego Maradona stole the game from England for Argentina by cheating. He got away with it and the ‘goal’ stood altering what might have been cheating an army of supporters in the process. Suarez cheated also, stopping a certain goal with his hands on the goal line a few competitions ago. The resulting penalty was saved and Uruguay went on to the next round of the competition through cheating. Now of course, the same player has become the big news story for biting an Italian player. The Americans, fed with a diet of American Football in particular, look at soccer as a game for wimps. Players are constantly falling, rolling around in agony at the slightest thing, only to get up seconds later and continue as if nothing happened. They dive, cheat and play for a tie. To the American mind trained from birth to compete and win at almost any cost, this is bizarre and what is even more bizarre as that the entire rest of the world is crazy about this game. The World Cup really is a global competition unlike the laughingly called World Championship of baseball for example… which involves only American and Canadian teams and which reverberates across the globe as a colossal yawn of disinterest and boredom. American Football isn’t ever going to be global either. I quite enjoyed the game but for most, its a bunch of over muscled and overhyped fat guys wearing body armour playing in 20 second bursts and taking breaks at every opportunity moving a rugby ball up and down a field. It’s rugby for wimps basically. But the Americans have a point don’t they? I hate players diving and feigning injury. In particular, I detest the cheating. Diego Maradona is a hero to many people. To me he is simply a cheat. For all his skills on the field he cheated and he should never have been allowed to play soccer again for that. The same for Suarez. Yes, he is a talented and skilled athlete but he is a cheat with a childish temper tantrum problem and he too should be banned from playing. Why? It’s actually very simple. These are the people our kids look up to. They are role models. Like many modern role models, they are human first but and to me its a big but, but they should be held accountable for that influence. Cheating is cheating. It’s abhorrent and should not be tolerated. Rather than be seen as heroes, these players should be seen as cheats and held up as examples of how not to play soccer – or life.